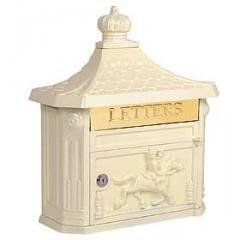 Victorian Wall Mount Mailboxes | Mailbox Collections, etc. Victorian Wall Mount Mailboxes. 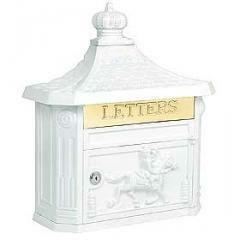 Locking Victorian mailboxes - our locking Victorian mailboxes are the perfect welcome to your home or office. 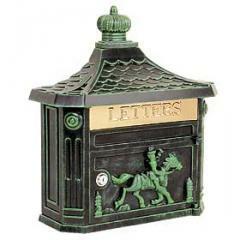 Victorian Mailboxes are made of cast aluminum, surface mounted Victorian mailboxes are available in four (4) contemporary colors and include a 10 3/4 in W x 2 1/4 in H mail flap with the word "LETTERS" engraved on it. Surface mounted Victorian mailboxes include a front access 10 3/4 in W x 6 in H door and a lock with two (2) keys. 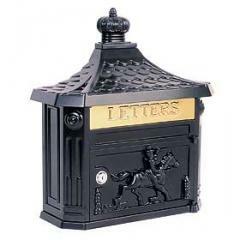 Surface mounted Victorian mailboxes may be used for U.S.P.S residential door mail delivery.